Property 58: island apartment. 2km from the sea and 10 minutes from the center. Semi-detached house. Bardineto the mountain within reach of the sea ..
Property 97: Bardineto the mountain within reach of the sea ..
Great apartment about 8 min walk from the main square of Finale Ligure and right across from many beaches. The apartment has all that is needed for a comfortable stay. The kitchen is well equipped with everything needed to make meals. The apartment is right next door to the grocery store and was very convenient for getting supplies and making meals. The apartment is very modern and is equipped with AC and blinds which help during the evening and sleeping hours. When we travel we look for a clean apartment and this one was very clean and ready for us when we arrived. All communication with Vittoria was excellent and she was very attentive to any questions we had. Upon our departure Melina (Vittoria's mother) came by and gave us a going home gift- it was very thoughtful and appreciated. 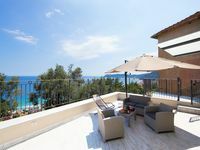 If you are considering Finale Ligure- you can't go wrong with this apartment.